Suitable for patios, balconies, carports, roof insulation, storage, etc. Since the fabric has different tensions in the warp and weft directions, there is a slight wrinkle on one side, which is normal. After the product is installed, it will flatten after sun exposure. The shade net is handmade and there will be minor errors. Please refer to the actual product. The area of the shading net is calculated according to the square, and the length * width is equal to the square number. Product delivery time is 10-15 days. If you do not receive the product within 30 days, please contact us as soon as possible. Thank you. 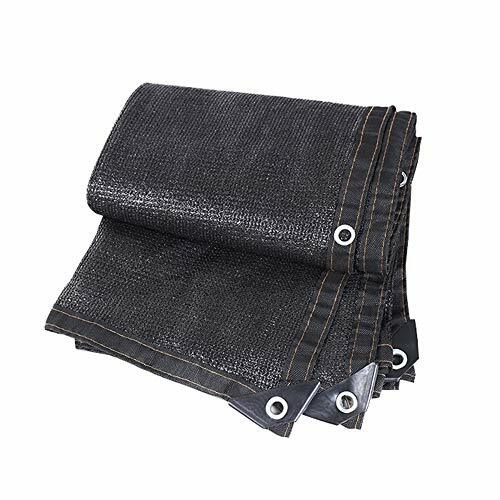 Made of high-quality polyethylene material, the warp and weft are clear and bright, the mesh surface is smooth and flat, the flat line and the stitch are parallel and even, and the anti-aging agent is added to resist the strong wind and be more durable. The design of the two-way car line is more resistant to pulling and good quality, avoiding frequent replacement. The design of the 8-needle net is clear, and the strong UV insulation makes the product cooler and more breathable, protecting the plants from photosynthesis. Corner angle, reinforcement corner, widened thick edging, moderate elasticity, elastic, no stiffness, no rough, flat and thick space. Suitable for outdoor garages, balconies, roofs, factories, greenhouses, courtyards, playgrounds, swimming pools, etc. If you have any questions about this product by Shading net, contact us by completing and submitting the form below. If you are looking for a specif part number, please include it with your message.